I've hunted my entire life, started with wild pheasants in NYS to date myself and have hunted deer all my life as well, normally we get together as a gang and drive the deer to the watchers, we had the run of lot of acres and got along with the neighbors but like everything in life things change. Farming methods and land ownership changed clearing hedgerows and allowing many people access to the land - our deer numbers have dropped and their escape routes are no longer predictable. At the same time we all got older and don't enjoy plodding through the swamps all day as we used to. I guess we politely call this patience. So sitting has become more of my deer hunting time. I never got into scent lock clothing or scents to draw deer in, try grunting & bleating from time to time but count more on good positioning of my stands. I also don't care one way or the other about managing deer herd for rack size, I feel people should be able to get out and enjoy the woods, harvest a deer and teach the tradition to our youth. 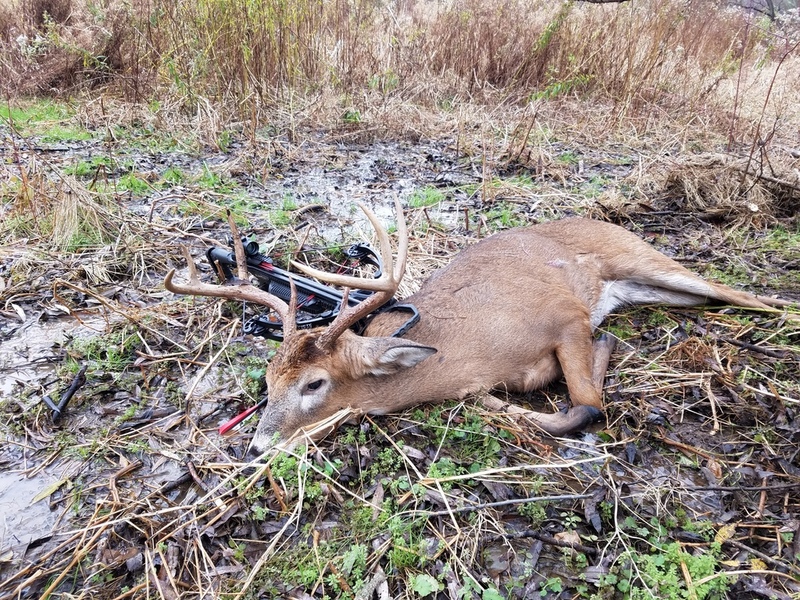 Now on with the story: I bow hunted this year but didn't take time enough to practice to be comfortable beyond a gimme shot so I bought a crossbow this year and on the 4th day of the season shot a beautiful 8 point at the edge of my little farm. I was pumped and my wife even said to get it mounted. I've also been enjoying my late (hunter) blooming daughter's stories & excitement of her bow & gun hunting this year, shes 28 and started hunting 3 years ago. 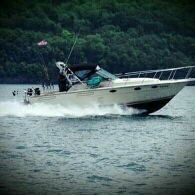 She owns a little land with great hunting opportunities 40 miles west of me. Thanksgiving day she and her boyfriend came to hunt with me so I put them on reasonable stands for the wind and took another stand for myself. About an hour and a half later they are texting me that she got cold and was back at the house making breakfast. 10 steps off my ladder and I here a shot a couple hundred yards south of me in the woods - I walk out a little ticked that I should have stayed longer in my spot.After a very nice breakfast we went back out and her boyfriend and I where going to try and push some woods to her. She got in a stand and I said we should push this little corn field out on our way to start her drive. The field is terrible, the tallest corn is 5", most only 3'. 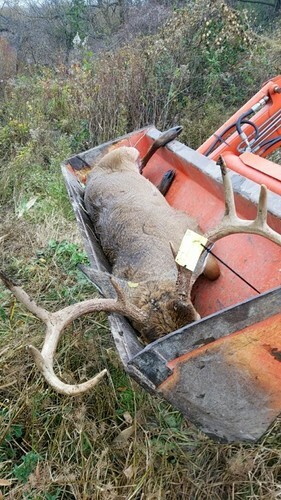 He and I walked 200' and up jumps a buck 15 yards from me bigger than my crossbow buck. When I threw the gun up my illuminated crosshairs where REALLY dim, I quickly turned the knob and as I brought gun up again the buck was stopped and I had NO visible crosshair, I cranked it around a couple more clicks and the deer had gone to where we entered the field and stopped - I had a nice bright site and took a shot - then the deer was gone. Boyfriend and I raced back to where I shot and blood everywhere. Deer was headed for my daughter and I yelled to warn her, got boyfriend to circle other side of the brush lot. 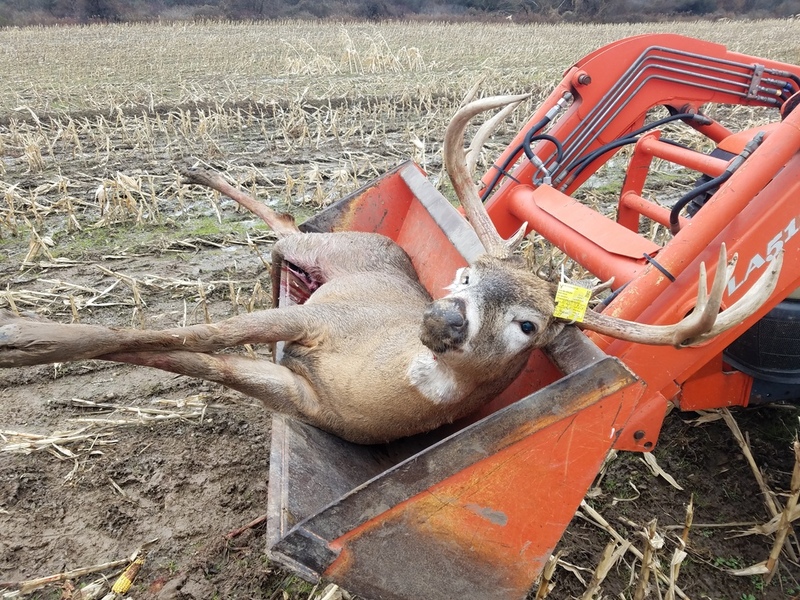 I slowly worked my way into brush from an angle of bucks path and cut his trail still bleeding, I made it across the creek when I heard boyfriend start shooting so I plowed my way out and caught up with him. He was lit up from the size of the rack and my daughter was running up to me as well because she saw him out in the field from her stand. So I got her to circle north in the swamp and boyfriend south to the end of an abandoned pasture where he jumped another buck but didn't shoot at it as he was already low on shells. Too quickly I started for where he went into the pasture when I heard crashing in the brush so I backed up to where I could see across to the field on the other side just in time to see a doe go north, I knew the buck would follow her and 3 seconds later I got another 2 shots at him. When I made it to that field he was stumbling and laying down, wobble a couple steps and fall again. I caught him and reluctantly shot him again. Boyfriend was good shot and got a couple in him and I broke a hinf leg with one of my last 2 shots. When we got looking at him he had been rifle shot through both sides of a rear hoof about an inch up - I'm sure thats why he was laying in the open and moving slower than normal. I always say I'd rather be lucky than good. 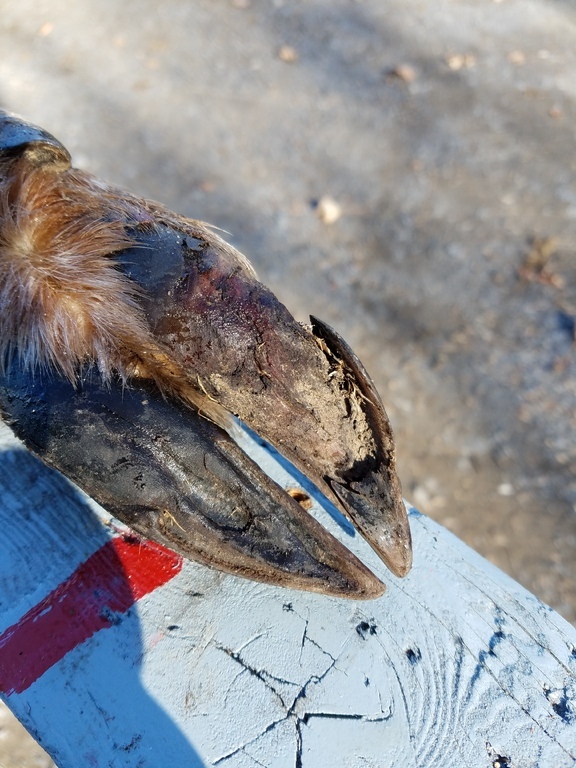 As a side note I included a picture of first deers front hoof, he was limping when I shot him. He jumped slightly when I shot him, walked 6 more steps and flipped over dead - I love my crossbow. Great story thanks for sharing. 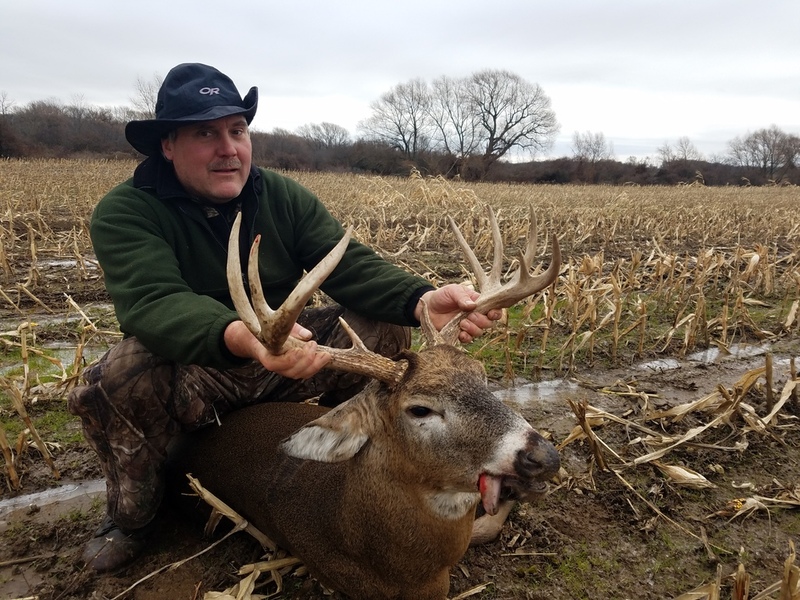 Congratulations on 2 great bucks. 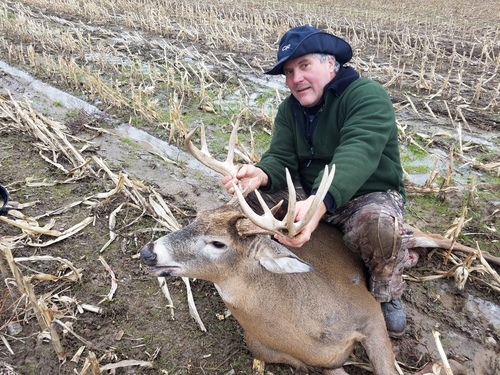 Nice buck and story. I wonder if the buck wore his hooves bad from rut chasing? I have seen similar. Wow. Thats a nice wide rack. Good looking buck. Great story.